Burman, E. (2011) ‘Emotions and reflexivity in feminised education research’, pp234-253 in I. Parker (ed.) Critical Psychology: Critical concepts in psychology. Vol 3 (Psychologisation and Psychological Culture). Abingdon and New York: Routledge. Isbn: 978 0 415 56862-3. Burman, E. (2011) ‘The crisis in modern social psychology and how to find it’, pp.25-45 in I. Parker (ed.) Critical Psychology: Critical concepts in psychology. Vol 2 (Contradictions in psychology and elements of resistance), Abingdon and New York; Routledge. Isbn: 978 0 415 56861 6. Burman, E. (2011) ‘Gender and childhood in neoliberal times: contemporary tropes of the boychild in psychological culture’, p.18-34 in Lesnik-Oberstein, K. (Ed.) Children in Culture, Revisited: further approaches to childhood2. Basingstoke: Palgrave Macmillan isbn: 978 0 230 27554 6. Burman, E. (2011) ‘Environ-mentalizing the matrix’, Group Analysis, Vol 44(4): 374–384; DOI: 10.1177/053331641141737. Burman, E. (2010) ‘Un/thinking children in development: A contribution from northern antidevelopmental psychology’, pp9-26 in Gaile S. Cannella and Lourdes Dias Soto (Eds) Childhoods: a handbook, (Peter Lang Publishing). ISBN: 978 1 4331 0450 3. Burman, E. (2010) ‘Explicating the tactics of banal exclusion: a British example’ p.119-138 in Palmary, I. Burman, E., Chantler, K. and Kiguwe, P (Eds) Gender and Migration. London: Zed Press ISBN: 978 1 84813 410 2 (hb); 978 1 84813 411 9 (pb) / Issn: 1086 7155. Burman, E. (2009) ‘Resisting the de-radicalization of psychosocial analyses’, Psychoanalysis, Culture and Society, 13: 374-378. Kumar, M. and Burman, E. (2009) ‘Editorial: Critical/Subaltern perspectives on the UN MDGs’, Journal of Health Management, 11, 1: 1-14. DOI: 10.1177/097206340901100101. Kumar, M. and Burman, E. (2009) ‘Editorial: Critical/Subaltern perspectives on the UN MDGs’, Journal of Health Management, 11, 2: 265-278. DOI: 10.1177/097206340901100201. Burman, E. (2008) ‘Beyond ’emotional literacy’ in feminist and educational research’, British Educational Research Journal, 32, (1), pp. 1-19. Burman, E. (2008) ‘Beyond ‘Women vs. Children’ or ‘Women and Children’: Engendering Childhood and Reformulating Motherhood’, International Journal of Children’s Rights, 16, pp. 177–194. Burman, E. (2008) ‘Narratives of Challenging Research: Stirring tales of politics and practice’, in B. Harrison (Ed.) Life Story Research. London: Sage. Burman, E. (2008) ‘Review of Sarah Ahmed The Cultural Politics of Emotions’, Feminism & Psychology, 18, 1: 148-9. Burman, E. (2007) ‘Developmental Psychology’, in Willig, C. and Stainton Rogers, W. (eds) Qualitative Research in Psychology, London: Sage. Burman, E. (2007) Between Orientalism and Normalization: Cross-Cultural Lessons from Japan for a Critical History of Psychology History of Psychology, 10, (2), pp. 179–198. Burman, E. (2007) ‘Pedagogies and politics: shifting agendas within the gendering of childhood’, pp642-650 in Vol 3 of J. Kincheloe and R, Horn (eds.) Praeger Handbook of Education and Psychology (Isbn 0-313-33122-7) Greenwood Press. Burman, E. (2006) ‘Emotions and reflexivity in feminised education action research’, Educational Action Research, 14, 3, pp. 315–332. Burman, E. (2006) ‘Analytic Third or Law? Reflection vs. Regulation in Psychotherapy Case Notes’, 16, (4), pp. 445–450. Burman, E. (2006) ‘Engendering development: some methodological perspectives on child labour’, Forum for Qualitative Social Research, 7, 1 http://www.qualitative-research/net/fqs -texte/1-06/06-1-1-e.pdf Issn: 1438-5627. Burman, E. (2006) ‘Groups, therapy and institutions: Commentary on “The leader and the group”’, European Journal of Psychotherapy and Counselling, 8, 1: 93-98. Burman, E., Georgaca, E, Gordo-Lopez, A., Hodges, I. McLaughlin, T., and Parker, I. (2006) ‘Theorising Critical Psychology in Psychiatric Practice: Six Voices Interrupting Pathology’, Social Practice / Psychological Theorizing http://sppt-gulerce.boun.edu.tr/article2.aspx (accessed 20 April, 2006). Burman, E. (2006) ‘Emotions, reflexivity and feminised action research’, Educational Action Research, 14, 3: 315-332. Burman, E. (2005) ‘Engendering culture in psychology’, Theory & Psychology, 15, 4: 5 27-548. Burman, E. (2005) ‘Childhood, neoliberalism and the feminisation of childhood’, Gender and Education, 17, 4: 251-267. Burman, E. (2005) ‘Contemporary feminist contributions to debates on gender and sexuality: from identity to performance’, Group Analysis, 38, 1: 17-30. Burman, E. and Frosh, S. (2005) ‘Editorial: Special Issue on ‘Group Analysis and Contemporary Social Theory’, Group Analysis, 38, 1 , pp. 7-15. Alldred, P. and Burman, E. (2005) ‘Hearing and interpreting children’s voices: discourse analytic contributions’ p.175-198 in S. Greene and D. Hogan (eds) Researching Children’s Experience: approaches and methods. London: Sage. Burman, E. (2005) ‘Engendering culture in psychology’, Theory & Psychology, 15, 4: 527-548. (Newbury Park: Sage); issn: 0959-3543. Burman, E. (2005) ‘Childhood, neoliberalism and the feminisation of childhood’, Gender and Education, 17, 4: 251-267. (London: Taylor & Francis) issn: 0954-0253; 1360-0516 online: 05/040251-17. 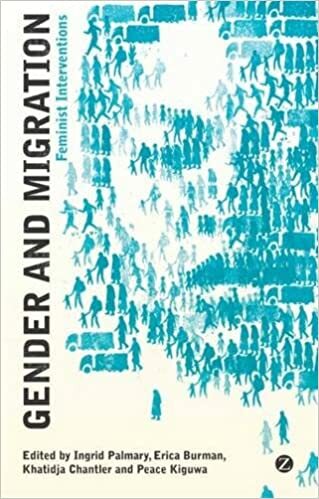 Burman, E. (2005) ‘Gender, childhood and development: new political subjectivities under neoliberalism?’, Kvinder Kon Forsking, 3: 6-18. issn: 0907-6182. Burman, E. and Chantler, K. (2004) ‘There’s No-Place Like Home: Emotional geographies of researching ‘race’ and refuge provision in Britain’, Gender, Place & Culture, 11, (3), pp. 375-397. Burman, E. (2004) ‘Boundary objects and group analysis: between psychoanalysis and social theory’, Group Analysis, 37, 3: 361-379. Burman. E. (2004) ‘Organising for change? Group analytic perspectives on a feminist action research project’, Group Analysis, 37, 1: 93-110. Burman, E. (2004) ‘Taking women’s voices: the psychological politics of feminisation’, Psychology of Women Section Review, 6, 1: 3-21. Burman, E., Smailes, S. and Chantler, K. (2004) ‘ “Culture” as a barrier to domestic violence services for minoritised women’, Critical Social Policy, 24, 3, pp. 358-384. Pratt, R., Burman, E. and Chantler, K. (2004) ‘Towards understanding domestic violence: reflections on research and the “domestic violence and minoritisation” project’, Journal of Community & Applied Social Psychology, 14: 33-43. Burman, E. and Chantler, K. (2003) ‘Across and between: reflections on researching “race”, gender and mental health’, Feminism & Psychology , 13, (3), pp. 302-309. Burman, E. (2002) ‘Gender, sexuality and power in groups’, Group Analysis , 35, (4), pp. 540-559. Burman, E., Chantler, K. and Batsleer, J. (2002) ‘Service responses to South Asian women who attempt suicide or self harm: Challenges for service commissioning and delivery’, Critical Social Policy , 22, (4), pp. 641-668. Burman, E. (2002) ‘The pernicious convergence of psychology, psychotherapy and technologies of gender’, Zeitschrift fur Padagogische Histriographie, 8 :33-5. (Verlag: Pestalozzium). Issn: 1424-845X. Burman, E. (2002) ‘Madres Cuidadosamente Observadas’. Cuardenos de Psicologia Social, 1:.207-218 Santiago de Chile: Universidad Arcis. Issn: 0717 9353. Burman, E. (2001) ‘Minding the Gap: positivism, psychology and the politics of qualitative research’, pp. 259-275 in D.Tolman and M. Brydon-Miller (eds) From Subjects to Subjectivities: a Handbook of Interpretive and Participatory Methods, New York and London: New York University Press (isbn: 0 8147 8258 2; 08147 82590). Bondi, L. and Burman, E. (2001) ‘Women and mental health: a feminist review’, Feminist Review, 68: 6-33. issn: 0415-14562-7. Burman, E. (2001) ‘Emotions in the classroom: and the institutional politics of knowledge’, Psychoanalytic Studies, 3, ¾: 313-324. (Carfax: issn: 1460-8952/1470-1049 online). Spandler, H., Burman, E., Goldberg, B., Margison, F. and Amos, T. (2000) ‘“A double-edged sword”: understanding gifts in psychotherapy’, European Journal of Psychotherapy, Health and Counselling, 3, 1: 77-101 (Routledge: issn: 1364 2537/1469 5901). Burman, E. (1999) ‘The child and the cyborg: metaphors of abjection and subjection’, in A. Gordo Lopez and I. Parker (eds) Cyberpsychology, London: Macmillan. (isbn: 0 333 7357 5; 0 333 73577 3). Aitken, G. and Burman, E.. (1999) ‘Keeping and crossing professional and racialized boundaries: implications for feminist practice’ pp 275-305 in E. Kimmel and M. Crawford (eds.) Innovations in Feminist Psychological Research. Cambridge/New York/Melbourne: Cambridge University Press. Isbn: 0-521-78640-1. Burman, E. (1999) ‘Planning Nurturance and Co-operation’, review of P. Marris (1996) The Politics of Uncertainty’, Theory & Psychology, 9, 2: 277-279. (Newbury Park: Sage), issn: 0959-3543. Burman, E. (1999) ‘Review of V. Walkerdine (1997) Daddy’s Girl: Young Girls and Popular Culture’, Feminism & Psychology, 9, 2: 197-200. (London: Sage.). issn: 0959-3535. Burman, E. (1998) ‘The child, the woman and the cyborg: (im)possibilities of a feminist developmental psychology’, in C. Griffin, K. Henwood and A. Phoenix (eds), Standpoints and Differences: feminist perspectives on psychology , pp. 210-232, London: Sage. Burman, E. (1998) ‘Deconstructing feminist psychology’ pp.1-29 in E. Burman (ed) Deconstructing Feminist Psychology, London: Sage.isbn: 0 8039 7639 9 (hbk); 0 8039 7640 2 (pbk). Burman, E (1998) ‘Review article: Jews and Gender (N. Harrowitz and B. Hyams, (eds) and Gender and Judaism (T. Rudavsky, ed)’, Feminist Review, 58: 133-7. (London: Routledge). issn: 0415-14562-7. Burman, E. , Levett, A., Kottler, A. and Parker, I. (1997) ‘Power and discourse: culture and power in South Africa’,, pp. 1-14 in A. Levett, A. Kottler, E. Burman and I. Parker (eds) Psychology, Culture and Power: discourse analysis in South Africa . London: Zed Books. isbn: 1 85649 471 3 (hbk) & 1 85649 472 1 (pbk); Southern Africa (co-published with University of Cape Town press): 1 919713 08 5. Parker, I., Levett. A., Kottler, A. and Burman, E. (1997) ‘On discourse, power, culture and change’, pp. 198-205 in A. Levett, A. Kottler, E. Burman and I. Parker (eds) Psychology, Culture and Power: discourse analysis in South Africa. London: Zed Books. isbn: 1 85649 471 3 (hbk) & 1 85649 472 1 (pbk); Southern Africa (co-published with University of Cape Town press): 1 919713 08 5. Burman, E. (1997) ‘Developmental Psychology and its Discontents’, pp.134-149 in D. Fox and I. Prilleltensky (eds) Critical Psychology: an introduction, London/New York: Sage. ; isbn: 0-7619-5210-1 (hbk); 0-7619-5211-X (pbk). Brown, L. and Burman, E. (1997) ‘Editors’ introduction: the delayed memory debate: why feminist voices matter’, Feminism & Psychology, 7, 2: 7-16. issn: 0959-3535. Burman, E. (1997) ‘Telling Stories: psychologists, children and the production of false memories’, Theory & Psychology, 7, 3: 291-309 (Newbury Park: Sage); issn: 0959-3543. Burman, E. (1997) ‘Minding the Gap: positivism, psychology and qualitative research’, Journal of Social Issues, 53, 4: 785-802 (Blackwell, MA, USA: SPSSI) (issn: 0022 4537). Burman, E. (1997) ‘Closely Observed Infants, Miller et al, 1989’, Changes: international journal of Psychology and Psychotherapy, 15, 4: 292-3. Burman, E. (1996) ‘Constructing and Deconstructing Childhood: images of children and charity appeals’, pp. 170-184 in J. Haworth (ed) Psychological Research: Innovative Methods and Strategies, London: Routledge. isbn: 0-415-11789-5 (hbk) & 0-45-11790-9 (pbk). Burman, E. (1996) ‘Foreword’ to S. Beazely, C. Kagan, S. Lewis, M. Moore and J. Sixsmith (1996) Children’s Reflections on Family Life, London: Falmer Press. isbn: 0 7507 0573 (hbk); 0 7507 0574 4 (pbk). Burman, E. (1996) ‘Local, Global or Globalized: child development and international child rights legislation’, Childhood: a global journal of child research, 3, 1: 45-66. (London: Sage.) issn: 0907-5682. Burman, E. (1996) ‘The Crisis in Modern Social Psychology and How to Find It’, South African Journal of Psychology, 26, 3: 135-42. (Pretoria; PSYSSA) issn: 081-2463. Burman, E. (1996) ‘Deconstructing Developmental Psychology: a feminist approach’, Nordisk Udkast, 2, 1: 3-18. (Copenhagen: Dansk Psykologisk Forlag); issn: 1396-3953. Burman, E.. (1996) ‘Review of Antisemitism, Misogyny and the Logic of Cultural Difference, N. Harrowitz, 1994’ Feminist Review, 53: 111-113 (London:Routledge.) issn: 0-415-14562-7. Burman, E. (1995) ‘The Abnormal Distribution of Development: child development and policies for Southern women’, Gender, Place and Culture , 2, (1), pp. 21-36. Burman, E. (1995) ‘Subjectivity, and Power in Feminist Psychotherapy’, In J. Siegfried (ed.) Therapeutic and Everyday Discourse as Behavior Change: Towards a micro-analysis in psychotherapy process research, New York: Ablex, pp. 469-89. Burman, E. (1995) ‘The Natural Rights of the Child’, in I. Lubek, R. van Hezewijk, G. Pheterson, C., Tolman (eds) Recent Developments in Theoretical Psychology, 1083-9283; isbn; 1-8261-8810-9 (pbk) pp.88-94. New York: Springer Verlag. Marks, D., Burman, E., Burman, L. and Parker, I. (1995) ‘Collaborative Research into Education Case Conferences’, Educational Psychology in Practice, 11, 1: 41-49. (London: Pitman.) issn: 0266-7363. Burman, E. (1995) ‘Developing Differences: childhood and economic development’, Children & Society, 9, 3: 121-141. (London: National Children’s Bureau); issn: 0951-0605. Burman, E. (1995) ‘The Spec(tac)ular Economy of Difference’, Feminism & Psychology: 5, 4: 543-546. (London: Sage); issn: 0959-3535. Burman, E. (1994) ‘Poor children: charity appeals and ideologies of childhood’ , Changes: International Journal of Psychology and Psychotherapy, 12, 1 : 29-36. Burman, E. (1994) ‘Identities, experience and alliances: feminist psychology and Jewish feminism’, in K.K. Bhavnani and A. Phoenix (eds) Shifting Identities, Shifting Racisms, pp.155-178. London: Sage. isbn: 0-8039-7786-7 (hbk) & 0-8039-7787-5 (pbk). Burman, E. (1994) ‘Transforming Psychology in South Africa’, Feminism & Psychology, 4, 3: 479-482 (London: Sage). issn: 1014-6046. Burman, E. (1993) ‘Towards a non-relativist discursive psychology: subjectivity and power in developmental research’, in B. Caplan, W. Thorngate and H. Stam (eds) Recent Developments in Theoretical Psychology, pp.433-442. New York: Springer Verlag.isbn: 0-387-97963-8 & 3-540-97963-8. Burman, E. (1993) ‘Review of P. Mitchell (1991) Developmental Psychology’, Feminism & Psychology: 3: 389-396. (London: Sage). issn: 0959-3535. Burman, E. (1992) ‘Review of A. Phoenix, A. Woollett and E. Lloyd (eds) Motherhood: meanings, practices and ideologies’, Feminist Review (London: Routledge.) issn: 0-415-14562-7. Burman, E. (1991) ‘What discourse is not’, Philosophical Psychology, 4, 3: 325-341 (Oxford: Carfax); issn: 0951-5089. Burman, E. (1990) ‘Differing with Deconstruction: a feminist critique’, in I. Parker and J. Shotter (eds) Deconstructing Social Psychology, London: Routledge, pp. 208-220. isbn: 0-415-01074 (pbk) & 0-415-01077-2 (hbk).